Thinking about getting a dog but can’t decide between an English Bulldog or a Pug? Well with a Miniature Bulldog you don’t have to choose – this pup packs a lot into their miniature 40lb size and is cousin to the Victorian Bulldog. A mellow little guy, or girl, who is always up for going out and meeting new people, but, they are also happy to sleep by the fire too. Mini but mighty, this dog will get on with everyone and is very robust, thriving in the city and countryside. But could this dog be the companion to take on your adventures with you? The batman to your Robin? Continue reading our pet parent’s guide below. Is a Miniature Bulldog a Good Family Dog? How Do You Train A Miniature Bulldog? How Much Does A Miniature Bulldog Puppy Cost? 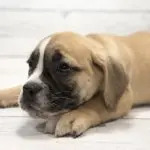 This companion breed is a purebred Bulldog crossed with a Pug, not to be confused with a Miniature English Bulldog, this pooch is fun and friendly. As their origin is unknown, it is impossible to know exactly how old this dog breed is, however, we do know that this dog was bred to be a companion dog. As a result they make a wonderful friend and do very well as a family pet. English Bulldogs where bred to bait and control bulls in England and is first seen back as far as the 1500s. Pugs are an even old are older breed, first seen as lapdogs in Asia as far back as 1600 BC! The Miniature is similar in appearance to their parent with a small and stocky build, characterised by a large head, strong body and short legs. They are easily identified by their flat faces and curly tails. 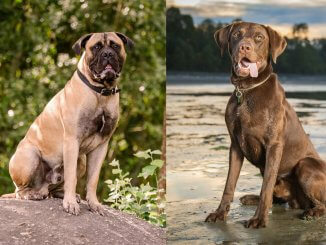 When it comes to height of a cross breed, the fastest way to approximate, is to add together the heights of the parents and divide by two – however, due to the size different between the Pug and Standard Bulldog, this method doesn’t always hold true. Generally, Mini Bulldogs are between 14 to 16 inches tall and weigh between 20 and 45lb. 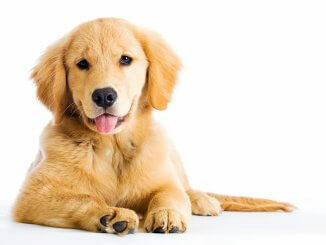 As with most things in a cross, the color of the dog’s coat will depend on the color of the parents. Pugs tend to be either fawn, silver or black. Bulldogs tend to be white, red, black, fawn or brindle. So your pooch can be any combination of these colours. This dog’s coat will vary depending on which parent it takes after. 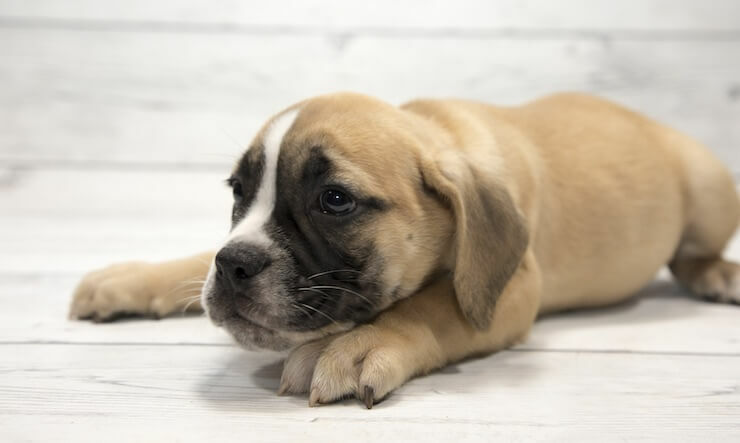 If your puppy takes dominant genes from his or her Pug parent, the coat will be short and silky, if the same is true for their Bulldog parent’s genes, their coat will be short and rough, but still glossy. As both parent breeds have a straight, dense and short coat, your Miniature will have this coat type. 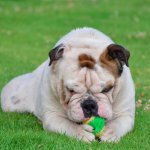 To understand the personality of the Miniature Bulldog it is useful to look at the temperament of the parent dogs, let’s start with the Bulldog. English Bulldogs are kind and loving dogs, they are renowned for their patience with children and their funny personalities. 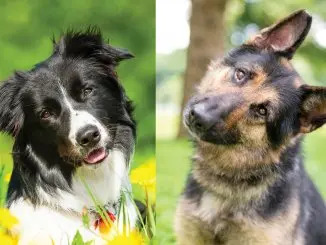 Although they are very energetic as puppies, when they grow up, they are very relaxed and calm dogs, content to potter about the house, eat food and sleep out their evenings on your couch. Pugs are known for their happy and bright personalities being often described as a shadow to their owner, they are very loyal dogs who are content to do whatever, so long as its by their owners’ side! They are an intelligent dog, who love to cause mischief! The Miniature Bulldog’s aim is to be the perfect blend of these two personalities. Happy like the Pug and relaxed like the English Bulldog, this dog fits in perfectly with people from all walks of life. Miniature Bulldogs are known for their peaceful nature. While they are known to be clownlike as a puppy, they are very mellow as adults, and like nothing more than to kip on the couch. Pugs are known to bark when bored and so your pup may inherit this from their parents. Bulldogs have a protective nature and bark when they feel that they or their pack are threatened. If socialised properly, this dog will get on well with all members of the family, including other pets. Due to the protectiveness of the Bulldog they may react negatively to the presents of unknown of unfamiliar animals or people. With correct, frequent and early socialisation as a puppy this should not be an issue. They make wonderful family pets as they have a sweet and gentle disposition of the Bulldog and actively try and gain human attention. As a result, they are brilliant with children and make brilliant family pets. Both the Pug and the English Bulldog love to please their owners so this will help with training this eager little dog. Consistency is key with this dog as they are not the smartest. You should start training as early as possible to help train and build a strong bond with your puppy. Inconsistency with training may result in misunderstanding and a dog who isn’t trained or socialized. Use only positive reinforcement dog training techniques, all forms of dominance based training have been de-bunked and will create health issues in your pooch. Adopt a consistent schedule of short daily training sessions lasting for a maximum of 10 minutes. Bulldogs respond very negatively to harsh tones and are very sensitive to your voice and so you should never shout at your dog. When training your dog, always focus on encouraging the correct behaviours, using dominance or force will dampen the trust created between you and your dog as they have an incredibly loyal nature, and any harshness will lead to strong feelings of betrayal. These are fun and loving dogs and get on well with all people. Caring for one is easy, as they are rather low maintenance, except for their constant demand for cuddles and belly rubs. Due to their exercise needs, they get on very well in apartments and do not need access to large amounts of outdoor space to run wild in! Exercising a Mini Bulldog is uncomplicated and easy. They do not need to run for miles every day like other dogs, they are more than content for a short walk to the park and back. These dogs are not particularly energetic, so you may spend more time convincing them to go walkies than actually walking. This being said, it is important to make sure they go for a daily walk, as this will benefit both their physical and mental health. Try to get your Miniature Bulldog up and moving for about 30 minutes every day – this can be through going for walks or through play. 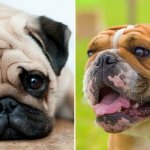 It is important to note that both Bulldogs and Pugs are brachycephalic dogs (i.e. they have flatter faces) – so your Miniature will too. This makes it harder for them to breathe when panting and they struggle to tolerate heat, so when playing is important to be careful as they may overheat. Yards can also be a place to play fun games with your dog, this dog loves a game of tug-of-war or hide and seek. These games will provide physical and psychological stimulation for your dog. As their coat is very easily managed, Miniature Bulldogs do not need regular grooming. They may need bathing when they get into something particularly messy, but, beyond that they have a very low maintenance coat. There is a possibility they may develop a skin condition (e.g. eczema), as this is common in bulldogs, which may lead to the need for regular baths with medicated shampoos to treat this. Both English Bulldogs and Pugs are low shedders, but, do shed seasonally, so this may be something to watch out for. If you choose to feed dry food to your dog, choose a high quality, grain free dry food that is formulated specifically for small dogs. Feed between 1 to 1.5 cups daily; 1/2 or 3/4 cup in the morning and 1/2 or 3/4 cup in the evening. When choosing a food, look for the Nutritional Adequacy Statement on the packaging to ensure you are purchasing the best food for your pooch. There are some instances of Miniature Bulldogs having a sensitive stomach, so make sure you feed your dog the same food and use a consistent feeding time to avoid any stomach problems. General feeding guidelines suggest that you should feed 20 to 30 calories per pound of body weight. As this dog is prone towards obesity, it may be best to feed towards the lower end of 20 calories per pound. For specific feeding advice, it may be best to consult your veterinarian as this is just a general guide. As previously mentioned, a Mini Bulldog is a cross between an English Bulldog and a Pug. 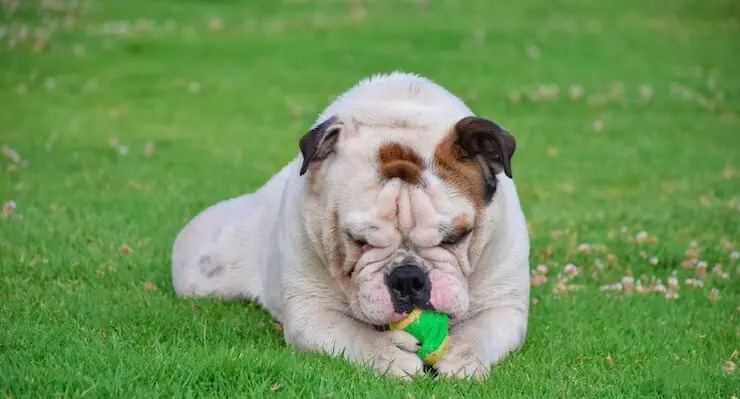 Due to the phenomenon of Hybrid Vigour, results in less genetic health problems; this is very important with a Bulldog because of their limited breeding pool and recent overbreeding. As a result, these dogs relatively healthy lives. What Is Their Typical Lifespan? Miniature Bulldogs usually live between 9 and 13 years, almost perfectly inbetween the 8-10 year Bulldog lifespan and 12-15 Pug lifespan. You will want to confirm the dog you are purchasing is in-fact a Miniature Bulldog. They are regularly confused with Miniature English Bulldogs, and, many amateur breeders will not know the difference. This miniature breed usually sell for between $800 and $1,200 USD. However, if you prefer to adopt, you may be able to find one through charities such as the American Bulldog Rescue. Most Bulldog puppies are born by Caesarean Section due to their large heads getting stuck in the birth canal, so the veterinarian fees may increase the cost of your puppy. If you are looking for a low-maintenance, fun loving friend then this is the dog for you. Fitting in well with everyone from all walks of life, this robust little dog will bring light to your life in a new way. They require very little exercise and grooming, compared to some other dogs, but they make up for it in large amounts of required fuss. However, there is potential for them to have many health problems, and they do not do well in hotter climates. 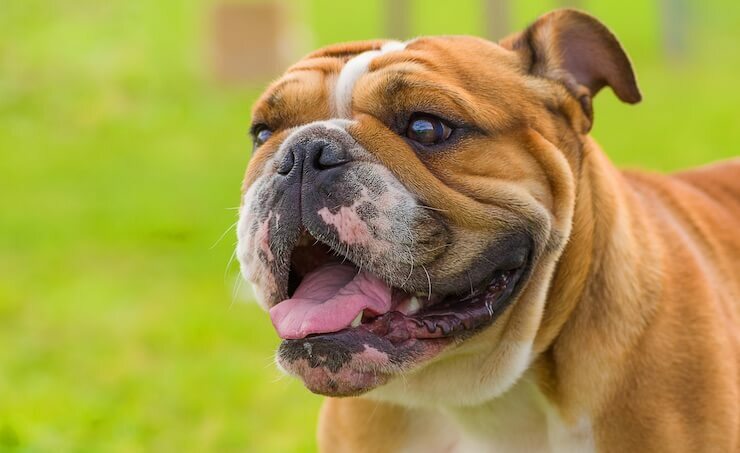 So if you do not have time to manage these potential health issues, and live in a hotter climate, it might be worth reading about their cousin – the Victorian Bulldog. Border Collie German Shepherd Mix – The World’s Best Family Dog?